Nerve gas or nerve agent is the name of a family of chemical poisons. Usually people call them nerve agents (they are not always gases). They work by changing the way the nerves work in the human body. They stop messages from the brain from getting sent to the muscles and organs. Nerve agents are organic chemicals that have phosphorus in them (organophosphates). Many organophosphates are pesticides, and have the same effects as nerve agents if people are exposed to them. However, these pesticides are not used against people as weapons like nerve agents are. Since they are chemical weapons, nerve agents are classified as weapons of mass destruction by the United Nations according to UN Resolution 687. Since 1993, making or stockpiling them has been against international law. Nerve agents have long-lasting effects. People who survive nerve agent poisoning almost always have chronic damage to the brain and nerves. This damage can also cause mental health problems. Nerve agents work by blocking communication between the brain and the body. Usually, a neurotransmitter (a chemical messenger) called acetylcholine gives the signal for the muscles to tighten up. It also keeps them from relaxing. However, when it is time for the muscles to relax, an enzyme called acetylcholinesterase destroys acetylcholine, and another neurotransmitter tells the muscles to relax. Nerve agents work by blocking acetyl-cholinesterase. Too much acetylcholine builds up, because it is not getting destroyed by acetylcholinesterase. The muscles keep getting more and more signals to tighten up. Basically, the brain loses control over the body's muscles. It cannot make the muscles relax. This leads to many of the unique signs and symptoms of nerve agent poisoning. Acetylcholine also signals the parasympathetic nervous system (PNS) to kick in. Usually, the PNS balances out with the sympathetic nervous system to maintain homeostasis. However, when there is too much acetylcholine, the two systems cannot balance, and the sympathetic nervous system does not work correctly. As the person gets worse, they will have muscle twitches, then start having seizures and go into status epilepticus. People can die because their brain cannot control their breathing muscles, and they stop breathing. These nerve gases are called "G series" because they were first created by German scientists. They were all discovered and made before or during World War II. Nobody agrees on why these nerve gases are called "V series." Different people say the V stands for "Victory," "Venomous" (poisonous), or "Viscous" (thick liquid). 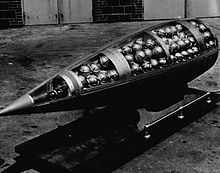 The most commonly known "V series" nerve gas, VX, was made in the 1950s by the United Kingdom's military researchers. Geneva Protocol of 1925: This agreement was signed on June 17, 1925, and took effect on February 8, 1928. It permanently bans the use of all forms of chemical and biological warfare. The agreement was signed after World War I, where mustard gas and other chemical weapons were used. People were afraid that chemical and biological warfare could have terrible effects in any future war. The protocol was extended by the Biological Weapons Convention (1972) and the Chemical Weapons Convention (1993). ↑ "Facts about Nerve Agents". Emergency Preparedness and Response. New York State Department of Health. July 23, 2014. Retrieved February 9, 2016. ↑ "Reference: C.N.492.2015.TREATIES-XXVI.3 (Depositary Notification)" (PDF). Secretary-General of the United Nations. September 18, 2015. Retrieved February 9, 2015. ↑ Sidell FR 1974. "Soman and sarin: clinical manifestations and treatment of accidental poisoning by organophosphates". Clinical Toxicology 7 (1): 1–17. doi:10.3109/15563657408987971. PMID 4838227. ↑ Wagner, Mary J.; Promes, Susan B. (January 1, 2007). Last Minute Emergency Medicine: A Concise Review for the Specialty Boards. McGraw Hill Professional. p. 12. ISBN 978-0-07-150975-6. ↑ 7.0 7.1 "EMS Subspecialty Certification Review Course: Organophosphates" (PDF). UTSW.ws. University of Texas Southwestern Medical Center. September 5, 2013. Retrieved February 9, 2016. ↑ Abbott, Parker, Mark S.; Rosado de Christenson, Melissa L.; Abbott, Gerald F. (2005). Teaching Atlas of Chest Imaging. New York: Thieme. ISBN 978-1588902306. ↑ 9.0 9.1 9.2 "Nerve Agents". emergency.cdc.gov. United States Centers for Disease Control and Prevention (CDC). April 19, 2013. Retrieved December 26, 2015. ↑ "Laws of War: Declaration on the Use of Projectiles the Object of Which is the Diffusion of Asphyxiating or Deleterious Gases; July 29, 1899". The Avalon Project: Documents in Law, History, and Diplomacy. Yale Law School Lillian Goldman Law Library. Retrieved February 9, 2016. ↑ "1925 Geneva Protocol". United Nations Office for Disarmament Affairs. United Natios. Retrieved February 9, 2016.